62,512 words to date, including Studies 1-2, the results of Study 3 and the Social Influence literature review. That’s not even half of what it will be when it’s finished. I’m so sorry reviewers. 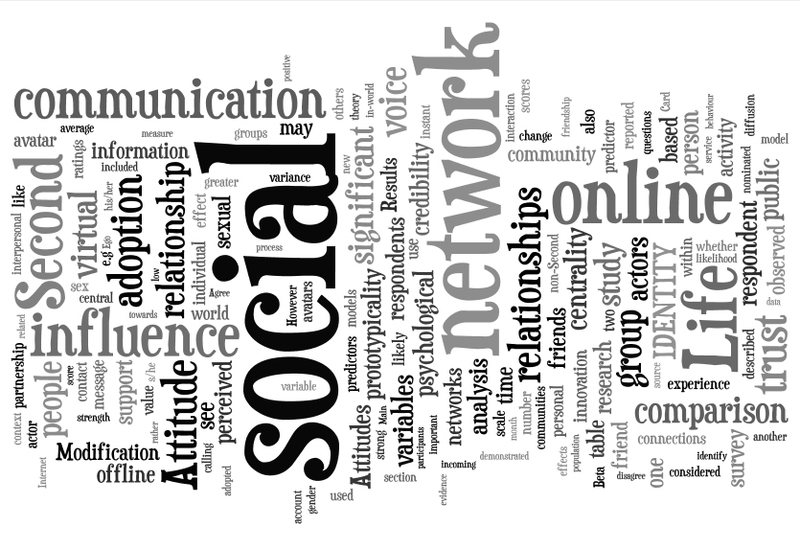 Pleased that “social”, “network”, “online” and “communication” feature so strongly. As those are the themes of the PhD, that means I’m doing something right. Made with wordle. You can see where the PhD has been made here. ~ by aleks on March 11, 2009. Does it really contain ‘prototypicality’ more often than ‘innovation’ or ‘one’? yes, Frank, I’m afraid it does. Well, as long as it has a good third act, I think it’ll be fine. Send ’em home signing, I say. Fascinating – absolutely fascinating. It’s a whole new (and different!) world out there! And it all had it’s start at “Laundry by George” in Gonzales???? Hmmm… yeah I have seen some of these words before! Talk soon!